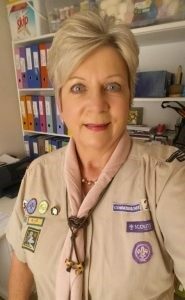 Joy has a teaching heart and has poured that passion into Scouting since she joined the Movement in 1997 as a Pack helper at 9th Benoni where her eldest son was a Cub. “Both my mom and sister were Girl Guides so I knew and understood the fundamentals of the movement from a young age. I became a Brownie in 1963 for about 2 years. I knew all along that one day I would join to help. 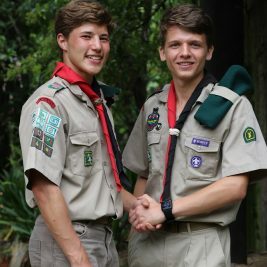 So when my son joined 9th Benoni Cub Pack I volunteered as a Pack helper for a few months and was then invested on Mother’s Day as an APS in 1998” she explains. 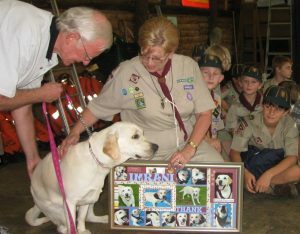 From 2000 to 2012 Joy took on the role of Pack Scouter. 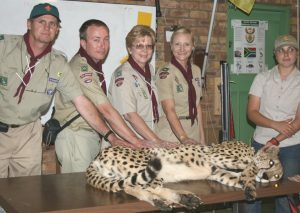 “We ran a very successful Cub Pack with a full complement of Cubs”, she says with pride. 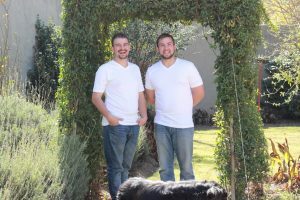 “ I have many happy and memorable memories, but I think a very special one that stands out for me from that time is when 9th Benoni sponsored 2 Guide Dogs. We met the guide dogs as puppies and followed their progress. This really touched my heart” she reminisces. When not at Scouting, Joy has enjoyed a successful administrative career in multiple finance and HR departments in the corporate field. She has a secretarial diploma and has studied part time through Unisa majoring in education and psychology.